This unique Nativity comes from two very different places. The Tagua nuts were harvested in Zambia (Africa) and then sent to China for carving. The Tagua tree is a palm tree that grows freely in some subtropical climates. The Tagua nut is very hard and takes on a beautiful ivory color. For this reason, Tagua is also known as Vegetable Ivory. The composition of the Tagua nut is so similar to mammal tusk that it is difficult to tell them apart. 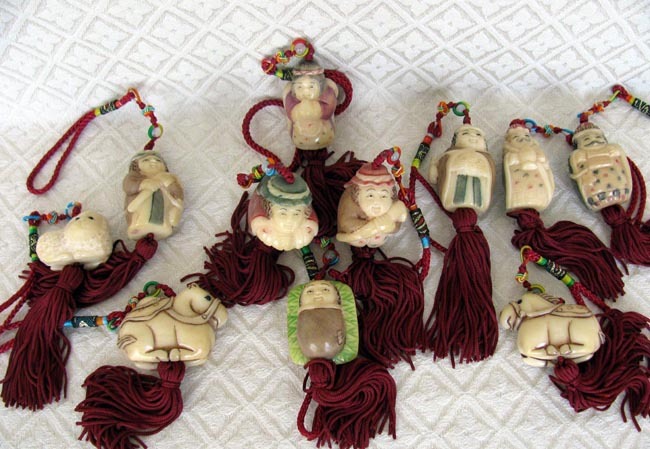 The Nativity was purchased in a jade market in Hong Kong. 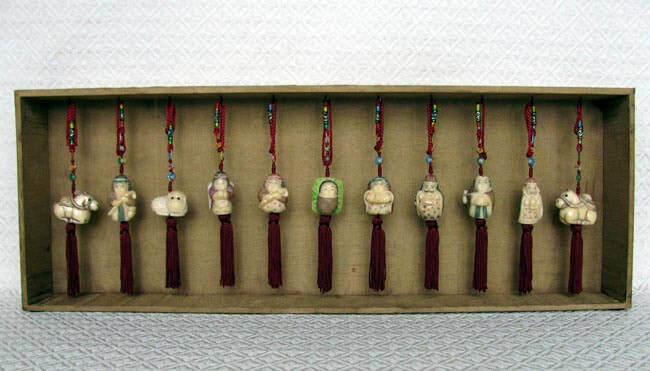 Each figure has a small Chinese symbol carved on the bottom that means good fortune. The eleven pieces include Joseph, Mary, Jesus in a cradle bed, an angel, a shepherd with staff, a sheep, two horses, and three wise men with gifts. The nuts are approximately 1.75 inches high or wide (animals).